You can save advanced searches that you'd like to run more than once in Marketplace. The "save" feature is only available in the One Copy/One User & Metered Access and Cost Per Circ sections. To save a search, follow the steps below. Select One Copy/One User & Metered Access or Cost Per Circ from the Shop drop-down menu. Select the Advanced search link at the top of the page. 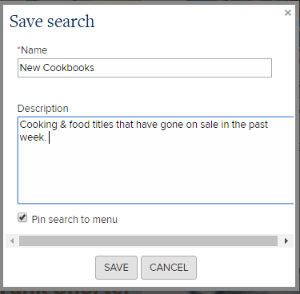 Fill in your search criteria, then select Save instead of Search. Name your search and (optionally) write a description. You can also pin the search to the left sidebar for easy access. Each time you run a saved or pinned search, it will refresh with the latest results that fit your search criteria. 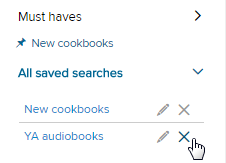 You can edit or delete your saved and pinned searches by expanding All saved searches in the left sidebar. Click the X icon to delete a search. Click the pencil icon to edit and re-save a search.